St. John’s Wort (Hypericum Perforatum) has effects on the nervous system. It calms the mind and restores the natural functioning of the brain. Generally, it is indicated for mild to moderate type of depression, anxiety, stress, and mood disorders. It is also found to be helpful in cases of premenstrual syndrome (PMS). It reduces cramps, irritability and breast tenderness in women with PMS. It is also helpful to reduce menopausal symptoms especially anxiety and mood changes. The external application exerts anti-inflammatory and antibacterial actions on the skin. It helps to treat eczema and skin irritation. It enhances healing of wound and burns. Scientific Name of St. John’s Wort is Hypericum Perforatum. St. John’s Wort is a perennial plant that grows up to 2 feet. Leaf Leaf is around 3 cm long and oblong or elliptic, and clasp to stem. Leaf has a smooth edge, light green and translucent dots that appears due to transparent oil glands. Flowers Flowers are yellow in color and star-shaped with 5 petals with several black dots. Hypericin and Hyperforin are likely to be psychoactive components. St. John’s Wort has following medicinal properties. Dopaminergic – modifies the effects of dopamine by inhibiting dopamine reuptake, so it increases the level of dopamine in the brain. Serotonergic – modifies the effects of serotonin by inhibiting serotonin reuptake, so it increases the level of serotonin in the brain. St John’s Wort (Hypericum Perforatum) is helpful in following health conditions. St. John’s Wort is most commonly used for depression treatment. The main area of its actions is neurological and mood disorders. It promotes normal energy level in the body. It also promotes normal sleep. It reduces restlessness, stress and the feeling of being nervous. St John’s Wort is a natural antidepressant. It is effective for mild to moderate depression. It is a safer option than prescription antidepressants because it has fewer side effects as compared to them. How Does St John’s Wort Work in Depression? In depression, serotonin level decreases. However, whether low serotonin level causes depression or depression causes a decrease in serotonin level is yet not confirmed, but St John’s Wort inhibits the reuptake of serotonin, which helps to increase serotonin level in the brain. It also has similar effects on dopamine and increases its level due dopaminergic action. It also acts as dopamine reuptake inhibitor. It also improves the level of norepinephrine in the brain. All these mechanisms of action improve the mood and reduce the symptoms of depression. Anxiety occurs due to reaction to stress. St John’s Wort improves mood and reduces stress, which ultimately helps to reduce anxiety. It reduces symptoms such as feeling weak, tiredness, loss of interest, and trouble concentrating. In anxiety, it does not work directly on anxiety. Actually, it works on stress. It makes a person feel good, easy and elevated. How Does St John’s Wort Work in Anxiety? Secondly, St John’s Wort improves dopamine and serotonin level in the brain and acts to reduce stress similarly as described under depression heading above. Who should not take St. John’s Wort in the case of Anxiety? There are very common questions. Does St John’s Wort work for anxiety? Does St John’s cause anxiety? Can St John’s Wort make anxiety worse? You might have read opposite views about its effects on anxiety. Some state it causes anxiety and other suggests it treats anxiety. You also might read anxiety as a side effect of St. John’s Wort. You need to understand where it works and where it does not. There are two types of anxiety – active anxiety and passive anxiety. However, both conditions occur due to underlying stress. In the case of active anxiety, people are anxious, but also have increased heart rate, hyperventilation, trembling, sweating, and dry mouth. In these symptoms, St John’s Wort will not work and it will likely to worsen the condition. People tends to have this type of symptoms are likely to suffer from anxiety as a side effect of St. John’s Wort. In the case of passive anxiety, people feel nervous, but have stress, feel tired, weak, low energy, loss of interest, and avoid to work, procrastination and laziness. In such case, St John’s Wort will work to reduce anxiety. People tends to have this type of symptoms are likely to get benefits from St. John’s Wort. It reduces chronic fatigue and aching muscles and joints when it is used along with Ashwagandha and fennel seeds. Seasonal Affective Disorder (SAD) or winter blues occurs due to lack of sunlight and characterized by feeling of sadness, moodiness, irritability, anxiety, loss of interest in usual activities, craving for carbohydrates, weight gain, tiredness even when sleeping more and trouble in concentrating. St John’s Wort improves mood and reduces other symptoms of SAD. Some evidence suggests taking St. John’s Wort with light therapy gives better results in the treatment of SAD than phototherapy alone. St John’s Wort is available for therapeutic use in a different form including crude herb powder, extract, and tincture. Extract capsules or tablets are also available for which dosage should be as per the extract dosage. St. John’s Wort Powder is a natural, unprocessed, crude form of the herb. It is prepared by drying the herb under shade or in the sun and pulverized to make powder. It is the safest option and has fewer or negligible side effects. It is safer than St. John’s Wort extract and alcoholic tincture. It contains all-natural components of the herb, which also helps to pacify the adverse effects of each other and exerts a synergetic action to provide benefits. The general dosage of St. John’s Wort (Hypericum Perforatum) Powder is as follows. ** The maximum dosage of St. John’s Wort Powder is a general estimate. St. John’s Wort standardized Extract contains 0.3% Hypericin. So, 300 mg extract will contain 250 µg Hypericin. Generally, St. John’s Wort tablets or capsules contain extract. The general dosage of St. John’s Wort (Hypericum Perforatum) Extract is as follows. Children (under 18 years old) Safe Dosage: 5 mg per Kg body weight, but should not exceed 300 mg.
** The maximum dosage of St. John’s Wort Extract is a general estimate. Sometimes, St. John’s Wort Extract is also given in a dosage of 1800 mg thrice daily i.e. 5.4 grams per day. This dosage seems to be very unsafe, so we wrote maximum possible dosage up to 2.7 grams per day. St. John’s Wort (Hypericum Perforatum) is likely safe for the most people in the dosage less than 6 grams/day for its powder and 900 mg/day for its extract. Hypersensitivity for sunlight: In large dosage, it can increase sensitivity to sunlight, which might cause sunburns. 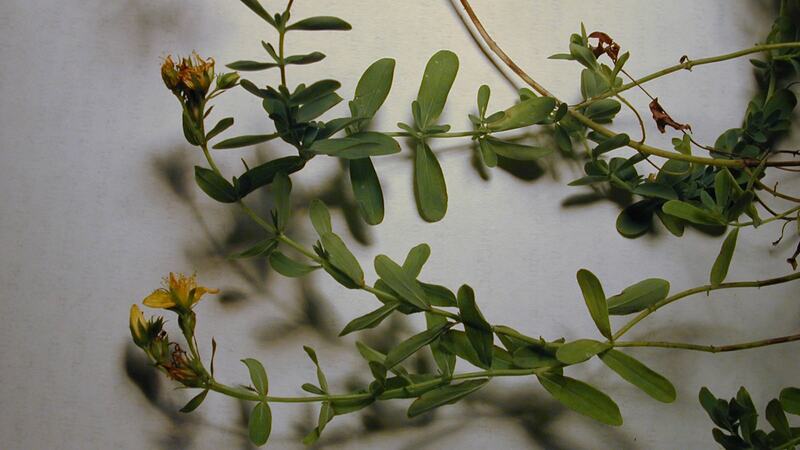 St. John’s Wort interacts with antidepressants, anxiolytics, anaesthetics, antiepileptics and analgesics. It affects plasma concertation of these drugs, which can decrease or increase the effects of these medicines.